Yesterday, it was announced by the Ministry of Manpower (MOM) that from 1 Jan 2017, operators of dormitories in factories and other workplaces will be required to provide workers with Wifi, personal lockers, means to provide feedback on their accommodation and a minimum of one sick bay or contingency plans for infectious disease cases. 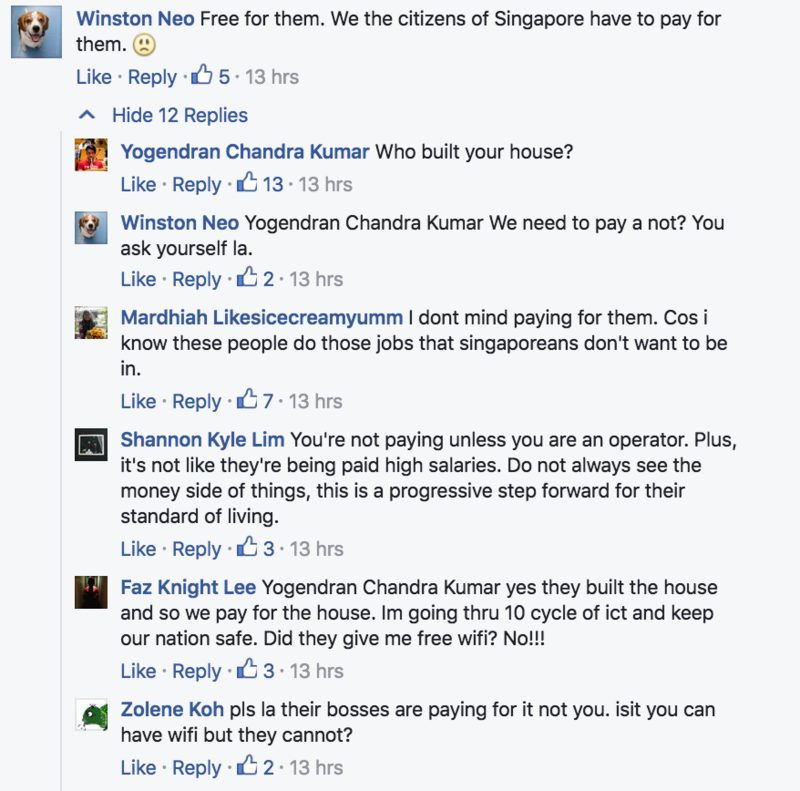 This comes in a bid to raise the living standards for foreign workers in Singapore. Currently, these factory-converted dorms (FCDs) are already required to provide one electrical point per worker, bed frames and clean sanitary facilities. With the new move, documents and photographs showing they’re following the rules, and regular MOM inspections, will also be carried out. An inspection by MOM since last August found that out of around 900 FCDs, 160 of them had substandard living conditions, and these dorms have been dealt with via warnings or prosecution. Minister of State for Manpower Teo Ser Luck mentioned that enforcement of the new conditions was decided on after feedback from industry players, and would ensure that workers are “better taken care of while they are here”. As of December 2015, MOM reported that there are 326,000 foreign workers in the construction industry here. Across news outlets, Singaporeans have been responding to the news positively, many of them saying that it was “about time” that we ensure workers are getting these amenities. 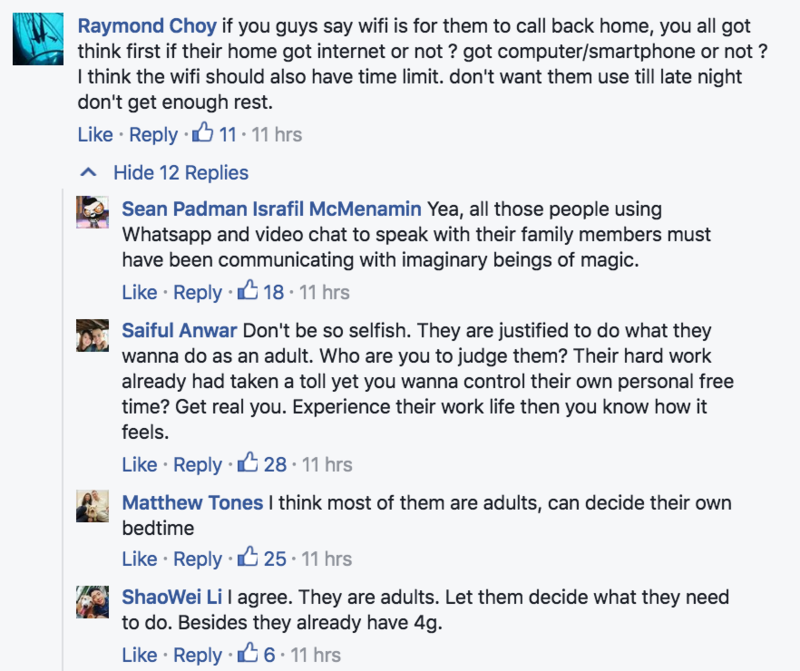 Needless to say, other comment threads also caught my eye, and it’s heartening to see Singaporeans standing up for the workers, who usually have no voice when it comes to matters like these. While I think that ensuring that these higher living standards are adhered to is a good step in helping our migrant workers, more outreach to them for their rights, safety and health issues, and laws that aid them is equally, or even more important. It would also be good if not only MOM and NGOs, but employers themselves do their part in ensuring the workers know what they deserve, and are getting it. Those of us working in offices get access to these information, and a means to complain if we don’t get what we deserve – so why can’t these workers, who have given up so much more for so much less, have that too? In fact, it’s not just employment rights, workplace safety is all the more important, especially with the recent news of the rise in workplace fatalities. Construction sites are a magnet for accidents, and the appalling statistics simply show that not enough is being done to ensure that our migrant workers are safe from potential dangers. They Built Our Homes, So Why Can’t We Create Good Ones For Them Too? If we needed to go overseas to work, would our loved ones wish that we are subjected to the poor living conditions that some of our workers are experiencing now? If we were to be working under an employer who doesn’t ensure that our employment rights, health and safety are adhered to, would we be able to accept it without having the means to voice our opinions, or worse, risk being sent home due to that? It’s not difficult to imagine these scenarios, and it’s thus not difficult to treat them like how we wish to be treated. They’re the ones who built our beautiful homes and offices, so why can’t we make sure that their living quarters are at the very least, comfortable as well?